I first met Andy Smith a couple of years ago at a BrewDog Burns night supper at the White Horse in Parson's Green. Andy was then working at North London's Redemption Brewery and I recall him telling me how his passion for food (he's a former chef) served him well as he started out as a brewer. Since then, Redemption has built a strong reputation for producing flavourful beers at a consistently high quality. Andy credits Head Brewer Andy Moffat for developing a solid brewing process, ensuring the recipes he designed (Big Chief being a personal favourite) really sung in the glass. Earlier this year, while discussing his next career move with Moffat, the idea of potentially going it alone was born. 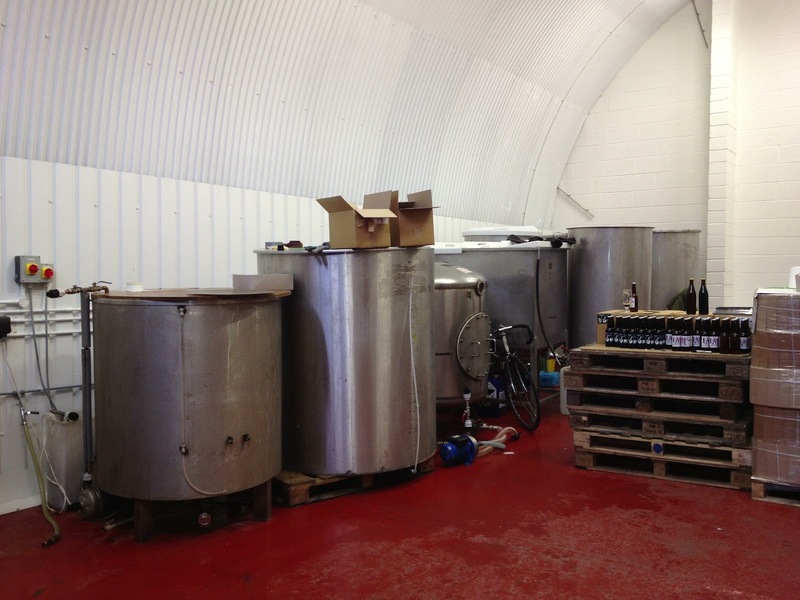 Andy is quick to credit his former boss with helping him to get Partizan off the ground but what really made his mind up was being offered Kernel Brewery's old 4BBL brew kit. Many a tasty brew has emerged from those tanks since Kernel started in 2009, but an expansion earlier this year meant it was surplus to requirements. As it turns out, the kit only had to move less than a mile to its new home, a converted railway arch in Bermondsey's Almond Road - a five minute walk from the tube station. Partizan's first brew in November was a big one - a 8.6% stout. Andy explained that he got better efficiency that he was expecting, and the starting gravity was therefore higher than planned. The beer is an absolute belter and I did a double take when I read the ABV on the bottle. It drinks a couple of points less than that for me - I could drink a few of these but session them at your peril! The second brew was a pale ale brewed with Citra, Pacific Jade and Cascade, weighing in at 5.1%. These two beers made up the initial launch, in bottles only, as Partizan won't be kegging or casking their beers for the foreseeable future, and these are now available to buy at the brewery on Saturdays, or from a good pub or beer retailer near you. The third beer is another pale ale, this time using the Wakatu hop from New Zealand (formerly known as Hallertau Aroma) with Cascade, and comes in at a slightly higher ABV. These are currently awaiting labels but should be released soon. I sampled this at the brewery and the aroma is fabulous! The fourth beer, a porter, was fermenting away when I visited and should be available in a few weeks. Andy is currently planning a Saison and intends to take a very seasonal approach to what he brews, with lots of variety and experimentation. This is great news for London's thriving scene and I for one will watch and drink with interest. The brewery is open to the public on Saturdays (drop a tweet to @PartizanBrewing to check if you're planning on visiting). You can expect a warm welcome and some great beer. Go visit! Thanks for commenting, Phil. 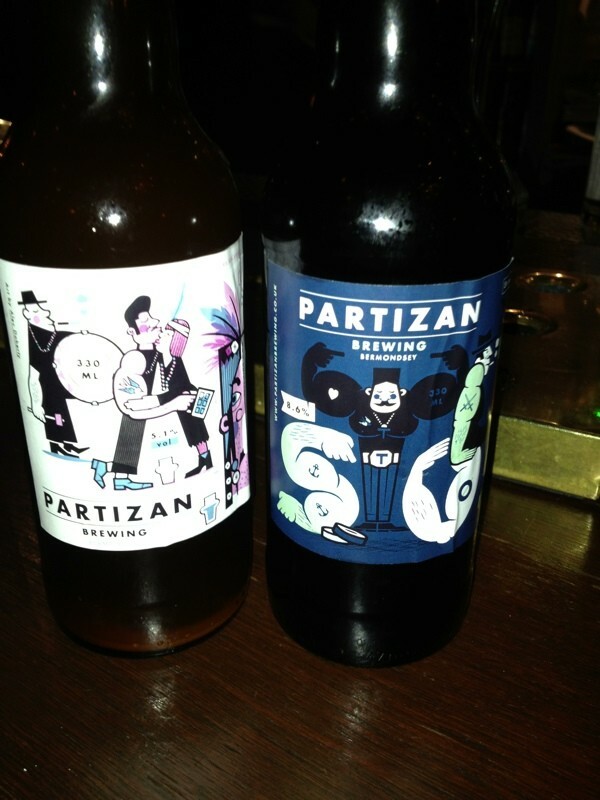 Yes, both beers are very good and a great way for Partizan to announce their arrival. I guess the other similarity with Kernel is the water given they're a stone's throw away. During one of my regular jaunts into London from Folkestone to collect a few boxes of Kernel, we saw the bottles of Pale Ale on the table in the Kernel Brewery. The guys at Kernel gave us his address and we popped round in the hope the Partizan Brewery would be open. Tasting the Pale Ale, with a fantastic aroma and super dryness we were hooked. We bought 48 bottles of the Wakatu Pale Ale and 48 bottles of the IPA. These fantastic beers are now available as part of our exclusive range of Artisan Beers in our bar. www.googies.co.uk A fantastic find. I'll be seeking out the IPA this weekend! Yes, a great find and I'm sure their branding sits alongside yours very nicely. Best of luck with your bar. I'm drinking the Pale Ale as I read this - so nice it prompted me to Google. I've been meaning to visit Kernel so I'll be dropping by some time in the New Year!